Serving Shanghai-style, Hong Kong-style, Japanese-style, and Chicken siomai, Siomai King sets its brand apart from a sea of competitors by offering five pieces siomai in one serving. It’s the first and original siomai brand to make such move. Owned by JC Franchising Inc., Siomai King is a Philippine-based company established by Jonathan So and Carlito Macadangdang Jr. in 2006. Aside from Siomai King, the two business minded individuals also offer Siopa “Da” King, Noodle House, Burger Factory, Sgt. Sisig and Tapsi Stop franchises. 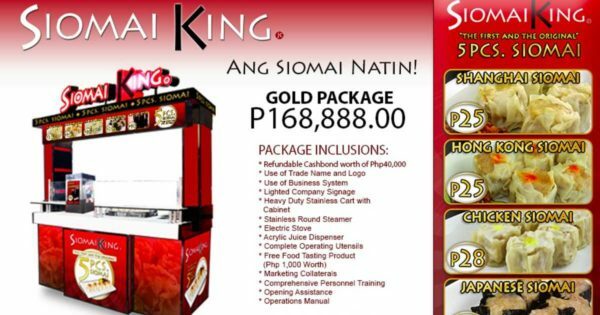 However, Siomai King remains to be their most popular franchise business because of its affordable franchise package, quality products, as well proven system and business model. PHOTO CREDIT: JC Franchising Inc.
Siomai King is one of the most sought-after and booming franchise businesses these days because of the quality, taste and affordability of its products. Compared to other siomai franchise businesses, Siomai King offers more value for your money as you can avail of 5 pieces of siomai for only P25. Siomai King franchises are strategically placed in locations with high foot traffic like Puregold, SM Hypermarket, Savemore, Gaisano Mall, NCCC Mall, as well as LRT, MRT and PNR stations.